Running a business is no small undertaking. There are many things you need to set up to get your operation running smoothly. For some, print is crucial to their success. Before all these amazing promotional products we now have at our finger tips, business forms were what we were offering when we opened shop in 1958. Honestly, I rarely write about print, which is silly. After all, we’ve gotten pretty good at it over the last 57 years. 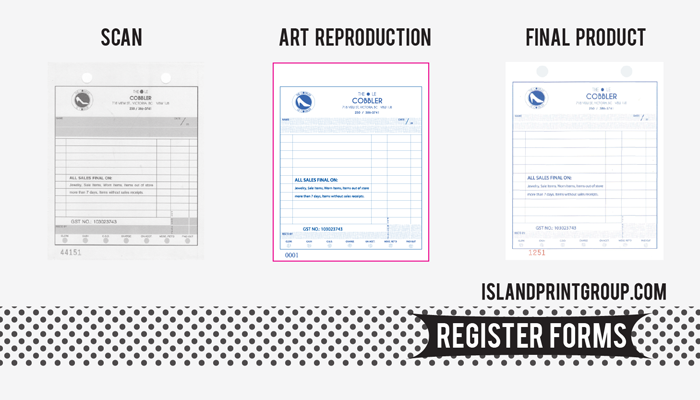 People use register forms in several different applications. So much so, that people have different names for them. Recently, a local Victoria customer, The Cobbler, just wanted what they had before. The “problem” was that we didn’t print it for them last time and they didn’t have any art files. This can be a headache at other print shops, as either art costs will be astronomical or they don’t have an in house art team capable of reproducing the art for you. Luckily for us, neither of those are the case. Take a look! Cool, eh? I love that a customer can just supply us with a scan of what they had before and we can go “Okay!” and run with it. The final is a 2 page form, white/yellow copies with NCR (no carbon required.) Completely custom to their business needs.